As Christmas is very quickly approaching, our calendar is getting really packed out; I think we have one or maybe two weekend days that are not occupied by either visiting friends or doing something to celebrate the festivities. We recently went to visit one of my closest friends Holly, she has been married to her husband for nearly a year and because of our busy lives, we don't get to meet up as often as we like; but when we did we started off immediately where we left off before. It was Holly's suggestion that we met up at her home for lunch; Mat (Holly's husband) had made the most delicious pizzas and snacks for us. Holly tells me that she no longer does any cooking as Mat takes charge of it all, I can't really pass comment on this as I am very lucky that Phil does the vast majority of cooking in our house; I think because he enjoys it and at the end of the day I am just so incredibly tired after looking after the girls. After lunch we visited a local park near to them called Market Bosworth Country Park, which boasts mature trees, a lake, a planted arboretum with exotic species, a wild-flower meadow and a community woodland. In addition to this, it has a fab playground for the children. Whilst walking to the lake to feed the ducks, we came across some conkers lying on the ground; I have not seen conkers in many years, probably since my own childhood; it brought back so many lovely memories of playing conkers in the school playground. I never used to do anything to make my conkers harder, but I know some people used to, from baking them, coating them in vinegar, to leaving them in the freezer for a year etc, what did you used to do? Ruby had lots of fun hunting for the conkers and even found some in their shells, which she had to try really hard to open them up. We must have collected over 100 conkers! I think we all might have been caught up in the excitement and surprise at finding them that we totally forgot how many we had collected; we had to resort to putting them in the basket under Lottie's pushchair as we could not carry them all. We then fed some ducks and saw the fish swimming in the lake before we headed over to the woodland adventure playground. There was some lovely play equipment suitable for Ruby's age ranging from swings, climbing frames, balancing beams and slides. Even hubbie decided to give the slide a go and at one point I did really wonder if he would get stuck, but Ruby gave him a big kick to help him on his way. The heavens then opened and we had a mad dash back to the toilet block so we could try and keep dry, we waited for the rain to die down but it was showing no let up and water was starting to spread out on the floor in front of us; we decided to brave it and run for the car... we ended up getting very very wet! I think its fair to say that we all had a lovely day with Holly, Mat and Dillon. Hopefully we won't leave it so long before our next adventure together. When we got home, Ruby and I decided to make a festive centre piece out of our conkers. I find it amazing how doing something with the girls can cause me to reflect and bring back my own childhood memories. I would love to know what things you have done with your own children that have caused you to remember your own childhood. A couple of weeks ago we were kindly asked by Braun, if we would be happy to review their newest ear thermometer, and as I have been thinking about buying one for a long time, I immediately said yes. We have been very fortunate that the girls are not normally ill or unwell, but I still like to be prepared; I keep in stock paracetamol, ibuprofen, various creams and plasters etc, but one thing missing in our medical cupboard was a decent thermometer to check the girls temperature. 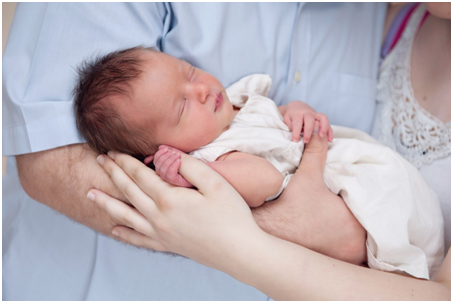 I'm sure if you ask any parent, checking their babies temperature is the first thing we do when they are unwell. We have tried various thermometers over the years, ones that can go under the tongue to ones that go on the forehead, but we have not had much success with them as they either break easily, or don't give a very accurate and repeatable reading. I have always wanted to buy a thermometer like the one I am reviewing, but I have held back purely due to the cost. When I agreed to do this review, I wasn't sure as to how long we would have the thermometer before we had cause to use it, but if you have been reading my blog recently you will know that our half term did not go to plan, and late last Sunday evening we had to rush Lottie into hospital as she was having some breathing difficulties; it was later discovered that she had a very bad case of croup and this was causing her to have a fever. 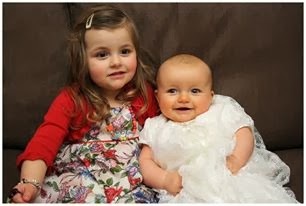 We were discharged from hospital and Lottie was on steroids; we were advised to keep a very close eye on her temperature. Fortunately for us, we were woken up the following morning by our postman, who delivered our new thermometer; this could not have arrived at a better time! The Braun ThermoScan 5 Ear Thermometer retails at around £40 - £45, which I thought was a lot money when I found out, particularly as you can pick up a basic thermometer for a fraction of the price. After using it though, I definately think its worth every penny and would really recommend every parent to go and buy one. Braun say: "The ear is an excellent site to measure temperature. Braun ThermoScan measures the infrared heat generated by the eardrum and the surrounding tissues. The eardrum shares blood supply with the temperature control center in the brain. Therefore temperature changes are reflected more quickly and accurately than at other sites." I found it very easy to use and was pleasantly surprised how quickly it gave a reading; this is particularly helpful as Lottie wriggles around when trying to take her temperature, so using a more basic thermometer is virtually impossible. The thermometer comes with a plastic protective housing, complete with a compartment to store all of the spare Lens Filters (protective cover around the ear piece). The thermometer comes with 21 lens filters and two AA batteries to get you started. The only downside (other than the initial cost), is that you really need to purchase a number of spare disposable Lens Filters, which adds additional cost. This has greatly helped to offer me the reassurance that I have needed this last week, and I wish I had bought one sooner. I would not hesitate to recommend this product. Disclaimer: I was kindly given the thermometer to try at no cost, however all opinions and thoughts are my own. This week marked an important day for the Royal Family, as the youngest royal, Prince George, was Christened. I think the media has taken it for granted that everyone knows about Christenings, so in case you don't, here is a quick explanation. A Christening, otherwise known as a baptism, is a Christian ceremony, usually held in a church, but can also takes place in other locations, and exists to welcome a person (not just babies) into the Christian faith. The parents of Prince George have selected people to join them in caring for Prince George spiritually, and ensuring that he is brought up in a Christian household; these are known as God parents. 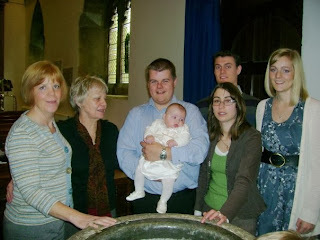 Traditionally, if a girl is being baptised, she would have two godmothers and one godfather, whereas a boy would traditionally have one godmother and two godfathers. These godparents should ideally be confirmed in the Church of England and be willing to teach and nurture the faith of the child that they are acting as godparent for. All too often I feel that the meaning behind a Christening is lost, and a lot of people are having the service in order to have a nice big party, not really understanding the importance of what they are doing. The promises made in the church service mean a great deal to my husband and I; before we made the decision to have both our daughters baptised, we made sure that we had read the promises that we would be making and that we agreed wholeheartedly with them. Holding a Christening is also a way of introducing children or even adults into the church family and giving them a very warm welcome. It was also important for us to have our daughters Christened in the church as it was our way of thanking God for them and promising to bring them up to follow Christ. I was not Christened as a baby, it was not something that was done in my family, and in fact very few members of my family attend church. I was baptised into the church of England at the age of twenty one and confirmed at twenty two; both events were very special and have helped to shape my life; one day I will write in greater detail about what led me to attending church. My husband and I regularly attend church, and in fact I had been church warden at my local parish church for three years. 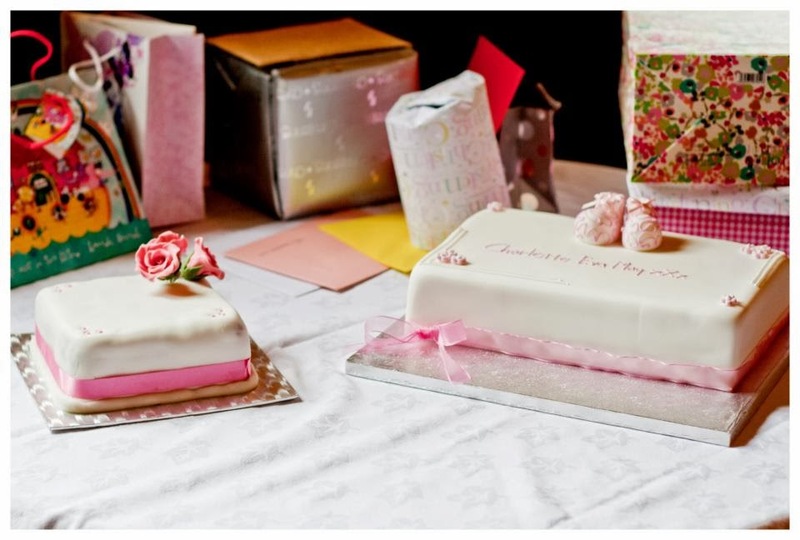 The idea of a party to mark Ruby and Lottie's Christenings really was not of any importance to me at all, but I wanted a way in which I could include people within my church community; we opted to put on a buffet open to everyone. The top tier of our wedding cake was used, but because we still had half a tier left, it never actually got cut and instead was saved the top tear for Lottie's Christening. Ruby's godparents were all members of our church, as I really wanted people who had their own strong faith that they would be able to share with our daughter. Ruby is fortunate to have three godmothers and one godfather, all of whom vary in ages. 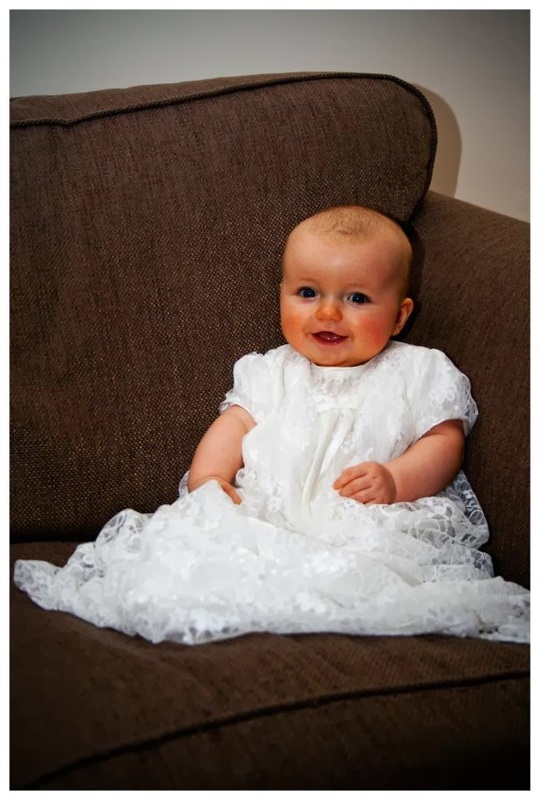 Ruby was Christened at just three months old. Lottie however, was Christened at nearer to six months old, mainly because I needed time to make her Christening gown, and knit her Christening cardi! To mark Lotties Christening, we went to my uncles pub and had a full three course sit down meal (the only way we could achieve this was to ask everyone to pay for their food). It was a really lovely and special day. 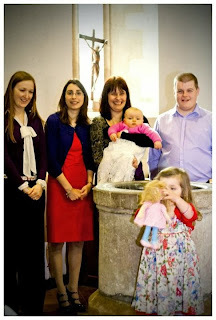 Lottie has three godmothers, but not any godfathers. Phil and I have always been in agreement that godparents should not be family, and must be someone whom we feel have some faith and can help guide our children through life. This week Ruby and I have been looking at some of the stories in the bible and exploring their meaning in a little more detail, as well as offering up prayers for the people we know who are in need of them. In passing, I mentioned to Ruby that my knee was hurting; she put her hands carefully on my knee and prayed that God would make my knee better, it was a very emotional moment, she is obviously listening and taking on board what we are trying to guide and teach her about how to live her life. Phil and I continue to take our daughters to church most weeks and we actively encourage our daughters to read bible studies and pray, but we also accept that they are entitled to their own views and might not want to be a Christian; but until they are able to make their own decision, we shall be bringing them up in the Christian faith. Half Term Didn't Start That Well!!! Well, I was really looking forward to half term and having lots of fun time with Ruby; I really feel that since Ruby has started at school, I've not really had much time to spend with her; school seems to be all encompassing, and life seems to be passing by so quickly. Ruby had been set a lot of homework in my opinion, she has two letter sounding books, where she needs to practice writing letters and making words. She also got set some homework on "eduction city", which is a computer programme that Ruby uses in school; she is getting very familiar with it. She has about 12 different exercises to do, each taking around 15 minutes. I decided early on to get the homework out of the way so that we could focus on the fun. but Sunday evening but a spanner in the works. Sunday evening, reflecting back, was a really scary evening; all was fine until just before the girl's bath time, Lottie started to cough; we just assumed she had a sore throat so we gave her some paracetamol and then bathed her and put her to bed. Within half an hour, things were really not right, she was struggling to breath, her breathing was really strange and I was starting to panic. Her temperature was rising and she was becoming more and more upset; at this point Ruby was asleep, so we put a jumper on her and placed her into the car along with Lottie and quickly made our way to the local hospital. I'm not one to normally panic, I'm normally really calm, but seeing my little Lottie have breathing difficulties was the scariest thing I've ever had to witness, and I hope I never have to go through it again. On arrival at the hospital we were seen by a doctor, whom I took an instant disliking to, as he had very little bedside manner and was a bit too rough in dealing with my little Lottie. After examining Lottie and doing various tests, he confirmed that it was likely she had a very nasty case of croup, which was affecting her breathing. We were given a ventral in inhaler and a course of 3 days of steroids in the hope things would improve. I'm pleased to say that the steroids appear to be doing a very good job as her breathing is so much better than it was. As we were at the hospital in the early hours of the morning and neither Phil or I had much sleep because we kept an eye on Lottie throughout the night, Phil requested to take a days holiday which was granted. I spent most of Monday in bed as my head was really hurting, no amount of painkillers were helping. As the day went by my headache got worse and turned into a migraine, and I was forced to lie down in a dark room, I couldn't even get on my iPad or iPhone. I think it's safe to say my migraine was brought on by the stress of having to take Lottie to hospital. I hoped Monday evening would be better than Sunday and in many respects it was as Lottie was more settled; unfortunately my headache caused me to be sick. Fortunately, when Tuesday morning came around, my headache had gone; Lottie is appears to be a lot more like herself, so lets try and start this half term again and bring on the playtime and fun! The leaves are now falling from the trees, which will soon be bare, and the gardens lovely bright colours are now beginning to fade; so a couple of weeks ago we set some bulbs for the springtime and we have planted a few winter primroses to add a little bit of colour into the garden. Ruby enjoys spending every spare minute she can playing outside in the garden and much prefers it to being inside, even if its really cold! One day after school this week Ruby, Lottie and I took a trip to the local park and had a lot of fun, I really feel that since Ruby has started school I don't actually get to spend that much time with any more, we seem to be in such a strict routine of get up, go to school, come home, have an hour together before dinner, bath and then bedtime. I'm really looking forward to next week as it is half term and I get to have Ruby back, but I'm not sure I will want to send her back to school after the week off. I miss her a lot when she's at school. Whilst walking back from the park, Ruby suggested we collected some things for an Autumn picture; we collected several different colour leaves, sticks and even found a conker. Ruby was very excited to get out the glue and do some art and craft to make an autumn picture. I drew a very basic outline of a tree and she cut and tore up the leaves before placing them onto the tree. For the trunk of the tree, she placed the sticks on it. Ruby had a lot of fun and thoroughly enjoyed doing her autumn picture; here is the end result. When Ruby was born I had good intentions of making all Ruby's dinners, and even doing some baby led weaning, however that didn't happen as I found it a lot easier to just reach for a jar; the variety of food Ruby was getting was much greater than I would cook, due to my limited cooking skills and the fact that I don't eat fish and eat very little meat. Lottie was six months old when it was time for her to be introduced to solid foods, I have done a mixture of jars and a lot of baby led weaning, compared to when I weaned Ruby. I think I was a lot more relaxed and chilled out being a second time round mummy, and just went with Lottie and took her lead. One of the great joys of baby led weaning is that you can get some great photos, here are the latest ones of Lottie eating her yoghurt all by herself. I think these photos are some of the best action shots that I've taken of Lottie, and I am so incredibly proud at how fast her hand - eye co-ordination is coming along. If only she got this excited about eating her vegetables! Our pregnancy was completely planned, we had decorated the nursery, bought the pram and I had worked out what finance would be available to me and what I would do with my various contracts as I was self employed. Everything was as organised as it could be and we were just waiting for that positive test until the joy and excitement of pregnancy began. We were so eager for that step, to become a family. Little did we know what was coming. In September we got that positive line and we couldn’t have been happier. We told our families straight away but, like most people, decided to wait until 12 weeks before really announcing it, just in case. I knew about morning sickness, of course, and had already said I was going to work through everything. I didn’t want to wrap myself in cotton wool and I very much felt I should just be able to get on with things until around April (a month before due date) when I would take maternity leave. By week 6, everything had to change. I had been getting gradually more and more nauseous until I started vomiting. I thought it was normal so didn’t seek any help until, after vomiting for 24 hours non stop keeping nothing down, my husband insisted on getting some help for me. By the time I saw the GP I hadn’t even managed a sip of water in 48 hours. He gave me some anti sickness meds and said if I wasn’t better by morning I had to go to hospital. I wasn’t. Friday 5th October I was sent to hospital and diagnosed as having Hyperemesis Gravidarum. I was shocked to discover that what I experienced wasn’t normal, not even close, that I had severe sickness. This was to be the start of a long and difficult journey. I decided to cancel all my work for the following week, thinking this would give me plenty of time to get back on my feet, and went home thinking that the meds would be the cure and I would be fine within no time. But a week later and I wasn’t feeling better and 2 weeks later I ended up in hospital again needing more fluids (at 10 weeks pregnant). From this point on I was constantly seeing medical professionals and begging for help, I was being passed around the people and being told there was nothing they could do. Meanwhile I was stuck at home, in bed, completely unable to do anything. I felt nauseous all the time and doing anything, moving, would make things so much worse. I was terrified of ending up in hospital again. My husband took all the burden of looking after me. Food was prepared for me to help myself to and my husband rang me twice a day to check up on me. My mum started coming down once a week to keep me company and do some jobs around the house for us. This continued until I had our daughter. Throughout the pregnancy I was determined to not blame the baby and really struggled mentally with what I was going through. I remember the second time I was admitted to hospital (10weeks) thinking “why am I going through all this? What’s it for?” and thinking about just ending it all. That visit to hospital I was given an early scan, to check it wasn’t twins, but that scan really helped hold me together for a few days and see a positive. Each scan had a really positive effect on me and pulled me up from my dark place, physically showed me that something was happening and it wasn’t just about the constant, never ending sickness. Through those early days I held on to the images of holding a baby afterwards, I surrounded myself in little clothes and imagined someone wearing them. We found out that we were having a little girl at 20 weeks and so named her. I made a conscious effort to always call the bump her and by name, remember that she was real and what we always wanted. 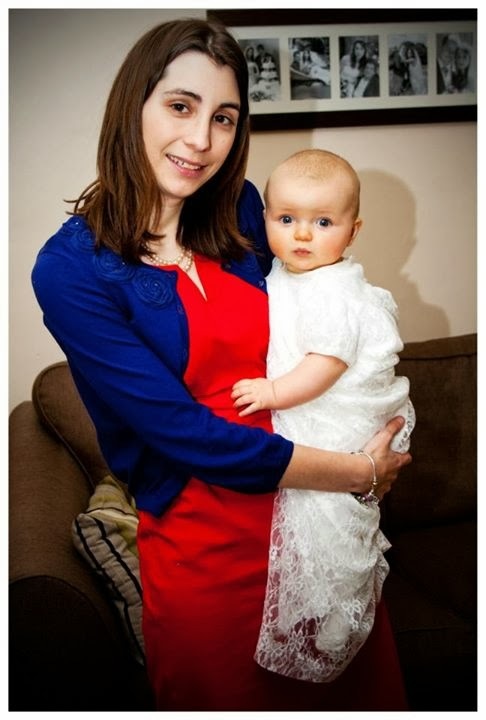 The pregnancy felt never ending for me, I was at home on the sofa or in bed all the time. 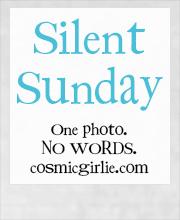 I felt completely isolated and I also felt that I had no friends supporting me. I was asked by medical professionals whether I had people coming and visiting, I would answer that my mum did as if that was enough but really, apart from that I had very few visits and felt really lonely. By 30 weeks I had well and truly had enough, I was treading water and I could no longer remember why I was doing it. People kept telling me it will all be worth it but she was my first, how did I KNOW she was worth it, how did anyone know how I would feel. I began to think that people were avoiding me, that they really couldn’t be bothered with how I was feeling even though I made an effort not to moan about it. I tried to hide how I was feeling to most people and most people told me how well I was looking, even though I felt awful inside. I was treading water and I knew I was gradually sinking. I was really desperate to have the pregnancy over but I knew that I had to get to the magic 37 week number. I felt so guilty that I was jealous of those that were having premature babies as I just wanted her out. I tried going to the GP about how I was feeling, but apparently I left it too late, as by the time I spoke to them it was too late for me to go on waiting lists and very little could be done. I was referred for an assessment but the nurse I spoke to didn’t really understand how pregnancy makes people feel, she told me that she would expect me to feel the way I did, but this didn’t help me to cope with it. She didn’t understand that I felt no bond with my baby and that I just wanted it over. She told me to just hold on “it’s not long now”, why do people think that makes everything better? If someone has flu and they are stuck in bed they say that a few days feels like forever, so imagine that you’ve had that for months on end and that you still have a or 2 month left, does that make you feel better? No it makes you even more depressed about how much longer is left to go. My poor husband spent the next few days trying to get help for me, it was the weekend so we couldn’t get help. He rang the GP who said to talk to the consultant, who had gone home. He rang a mental health helpline who told him I needed help, to talk to a GP. We rang the out of hours GP who completely didn’t understand and started talking about adoption!! Complete lack of understanding. Eventually after me shouting at him he agreed I needed an appointment, but we never got called back to arrange it. In the end my husband rang the labour ward and they agreed to see me. We went down there and I couldn’t let anyone touch me. They agreed that I should be induced but they couldn’t make the decision and I needed to see a consultant. To cut a long story short I was told to wait till Monday, so I spent the weekend covered up and curled up crying and being watched by my husband. Finally, after mistakes by the hospital and more fighting by my husband and midwife, I saw a doctor on Monday 4pm. She wouldn’t talk about induction until I’d seen a psychiatrist as she thought I was mentally unstable. The psychiatrist agreed I needed to be induced ASAP but of course they’d all gone home so I had to wait another day. I had an appointment on the Wednesday but I decided I couldn’t hold on any longer. I was still in a bad way and all I could think was what if they said no? I NEEDED it to be over. The way I saw it was that labour was the end and I would be fine once holding my baby. On Tuesday I finally got the go ahead and it was agreed I would be induced, that day. I couldn’t believe it was finally happening it was all ending. But they were too busy so I was delayed until the evening. Over the next few days I was given drugs to induce me but I was constantly put at the bottom of the list because I had nothing medically wrong with me. I spent hours not knowing what was going on and on monitors. No one took me seriously and considered that I would struggle being strapped to a bed being reminded of the bump constantly. I was still feeling very shaky and the smallest thing would set me over the edge. In the end my mum went and spoke to them and things were better after that. Induction was a long process that my body obviously wasn’t ready for. Tuesday it started and early hours of Saturday I had the baby. Nothing about labour was easy, my little girl got stuck so they used suction to pull her out, along with a cut. I had a temperature and my baby was tachycardic, she had also had some meconium in my waters so I was being closely monitored and not allowed to move or remain active. After they got her out I then bled and lost a lot of blood. All I wanted was to go home and be able to walk out in the fresh air, but due to those issues we had to stay in hospital for several days. Baby was on antibiotics and was jaundiced so needed a light box. I needed a blood transfusion. For days I felt so guilty that I had caused all of this, if I had been stronger, not needed to be induced maybe she, and I, would have been fine. I caused her pain and her first week was so traumatic. I felt like I’d shown no strength but realistically I know that I showed strength to get through those 9 months, to feel nausea every day since before I even knew I was pregnant, to even go through “normal” labour. I still have to remind myself I’m not weak and none it was my fault. I was told, before pregnant, that I was a natural mother, I feel like nothing about this has proved that. I had an awful pregnancy, an awful labour and the first few weeks haven’t been plain sailing as our little one has a milk allergy so we had her screaming in pain, discomfort and no sleep. Now, 1 month later, I’m still struggling to feel that it was all worth it. Now she has special milk she is a bundle of joy, she has started smiling and is quite responsive. She is a big positive but, at the moment, this big positive isn’t enough to overcome the negatives we’ve had to go through. We are still bonding, I’m still learning that she needs me and no one can replace that. She may be OK with cuddles from others but no one else is her mum, that’s me alone. HG is an illness, it stole my joyful pregnancy, it stole my labour and it stole my bonding time after baby was born. It has also stolen any further children we considered having. I’m sure the trauma of it all will fade over time, I won’t feel so raw thinking about it, but the knowledge that it could all happen again would break me. This time the only way I held on so long was due to hope it would get better, I won’t have that next time. On a more practical level HG has also stolen my job (I may have decided to stop but it forced the issue), our savings and the friends I thought I had. It feels like my life stopped on October 5th, when I first ended up in hospital, and only started again when I finally came home from hospital on May 22nd. I lost months of my life. Through all of this I have had the unending support of my husband, he has been a rock. My family have been there for me and my mum has given up so much time to be here for us, try and cheer me up and occupy me. A few friends have remained supportive and visited and rung, I’ve discovered who my real friends are. I have also discovered a really supportive group of new friends who have listened to me and been with me every step of the way. HG gave me some things too and this is the biggest gift of all. Over the last couple of weeks, I've been finding things have been getting on top of me - I really am not one to relax and put my feet up. There have been numerous things that have been on my mind. I've been worried about money; each month we are just about getting by; and were entitled to no help, it seems to be a juggling act. I have considered taking a job part time, but Phil's working hours can be all over the place, from leaving at 5am to returning home at 9pm, to staying away over night in this country or abroad. There is no room for me to have a regular job, however I am looking at the option of starting my own business! To add to my financial worries my car broke down and has had to have a new clutch fitted, I didn't realise how important my car was to me until I didn't have it for a week, I felt trapped and it really was not a nice feeling. I need my car to take Ruby to school, as there is no way I could walk 5 miles and there is no bus. I've also been finding things tough with my knee; you may recall I had operation mid August and the recovery is taking a lot longer than I anticipated. I am now back to driving and walking without crutches, but I am still on painkillers most days and unable to kneel and put pressure on my knee. Last week, I saw my physiotherapist again and I was told off for doing too much, but I realistically cannot do any less than what I am currently doing. I felt like my head was going to explode this last week, and I was really in need of some quiet "me" time. Thankfully there is a retreat house that is only a short drive away from where I live. Launde Abbey has been a place that has come to mean a great deal to me, I have been on many occasions just to have some time to relax, I went prior to my christening, confirmation and wedding. As soon as I drove up to Launde, I immediately started to feel like I was at home. As soon as I walked in I was welcomed by a familiar face, a local vicar who covers some of the services in my parish church. I had a lovely chat with him before I relaxed with a cup of tea and sampled some lovely home made cakes and biscuits. I really do feel like royalty when visiting Launde, they really live to look after people and know how to make them feel at home. I then spent some time chatting with the warden of the abbey, we chatted about everyday life and then moved onto talking about my faith. My faith matters a great deal to me; I come from a family who do not attend church, however when I had a particularly tough time in my teens, I decided to go to church and just see what it was about. My faith gives me hope, strength and gratitude for my life and where I am going and what plans God has for me. I came out of my chat feeling renewed and inspired by what the future holds. I then spent the rest of the day just having some me time, spending time in quiet in the chapel and enjoying walking around the grounds. The grounds are stunning, they have an amazing walled vegetable garden that I loved walking around and seeing what they were growing. All the produce is then used in the meals they make. Phil and I have spoken and we are both in agreement that its important that I do have some time out away from the girls so that I can have some breathing space and quiet, so I shall be returning to Launde Abbey shortly. What do you do, just for you to help you relax and unwind? On Tuesday we received an invitation from the lovely people behind Sugar Puffs and Honey Monster cereals, to attend a road show and meet the honey monster; initially it was just going to be Lottie and myself attending, however Ruby's school teachers were taking part in the national teachers unions strike, so it meant Ruby's school was closed for the day. Ruby was very excited at the prospect of getting to meet the Honey Monster; they had kindly sent her a cuddly soft toy version so she knew who she was looking for, and she was very excited when she saw him. She was initially a bit shy when she came face to face with him, but within a couple of minutes she was back to her normal self and was happily giving him lots of hugs. Ruby even had a great time helping the PR lady hand out samples to other members of the public; she had a natural ability at doing this job, so who knows, maybe in the future she might work in PR? Lottie on the other hand, was completely oblivious to what was happening around her and slept through the whole event. In addition to the cuddly Honey Monster toy, we were also sent a number of Honey Monster cereal products to review. The branding of the products are really eye catching and are very easy to spot on the shelf at a supermarket. They also clearly feature the Honey Monster! We were sent a box of the new Honey Monster "Choco Wows" and "Honey Wows" cereals to try. The cereals are low in salt and a great source of fibre; they have no artificial colours, flavours or preservatives and are fortified with vitamins and iron. They are also really tasty! The cereals are multigrain hoops coated in honey or chocolate, with oats and crisp rice; Lottie is a real little cereal monster and happily munched her way through a handful of both of the different varieties; Ruby on the other hand much preferred the Honey Wows over the Chocolate ones, which surprised me slightly, but she still ate a lot of them! Along with the boxes of cereals, we were sent two packs of Honey Monster "Stix" cereal bars to try. The bars come in two flavours, Honeycomb & Milk Chocolate, and Marshmallow & Vanilla Yoghurt. We have been really impressed with the cereal bars; they are a great size for lunch boxes as they are 15g; they are really tasty; my favourite has to be the chocolate variety. The other good thing about the bars is that they are not sticky and not too crunchy; they are definately something that I will be buying for Ruby's lunch box and letting Lottie have as a treat. As I mentioned before,I particularly enjoyed the Chocolate one, however I would have liked the option of a bigger bar as they are very tasty, but maybe I could have two? I think its fair to say that the new range of Honey Monster cereals have gone down very well in our household. We will definately be considering them when we do our next food shop. Disclaimer: We were kindly given some free samples to try however all opinions and thoughts are my own and that of my daughters.